Want to lighten up lunch or dinner? 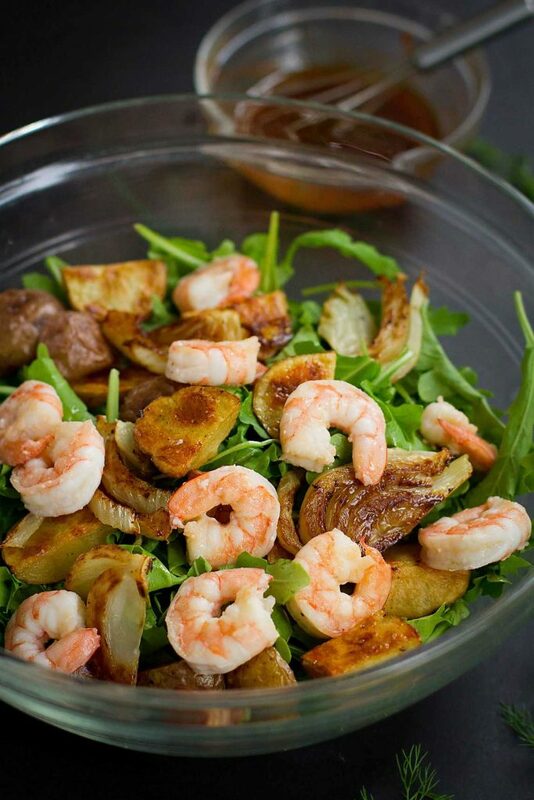 This healthy Roasted Potato Salad with Shrimp and Fennel is heavy on flavor, light on calories. Thank you to The Little Potato Company for helping me share this recipe with you. If you’re on Pinterest or Facebook at this time of year, chances are you’re feeling inundated with cookies, pies, candy and other holiday treats. I know I am! Just a little internet scrolling makes me feel as though my blood sugar is going to veer off the cliff. I’m definitely not suggesting that you don’t indulge a bit over the holidays. A little Brie cheese, Nutella fudge and my mother-in-law’s Christmas cookies never hurt anyone. All in moderation, right? Even though it sounds kind of crazy, healthy meals amidst all of the heavy dishes is my idea of comfort food. Perhaps because my body feels so much better when I’m eating balanced meals. For me, the key to moderation is filling half of my plate with veggies. Salads, steamed vegetables, spaghetti squash skillet, roasted mushrooms and plenty of healthy potato dishes. As much as I appreciate a great raw veggie salad, I tend to lean towards salads with roasted or sautéed vegetables and healthy protein when serving the salad as an entrée. Ever since I was young, roasted potatoes meant comfort food, whether they were served alongside my grandmother’s pot roast or as an accompaniment to something lighter. So much flavor can be added to potatoes just by tossing them in a little olive, seasoning with salt and pepper and roasting for half an hour. Golden brown, slightly crispy, salty…glorious! 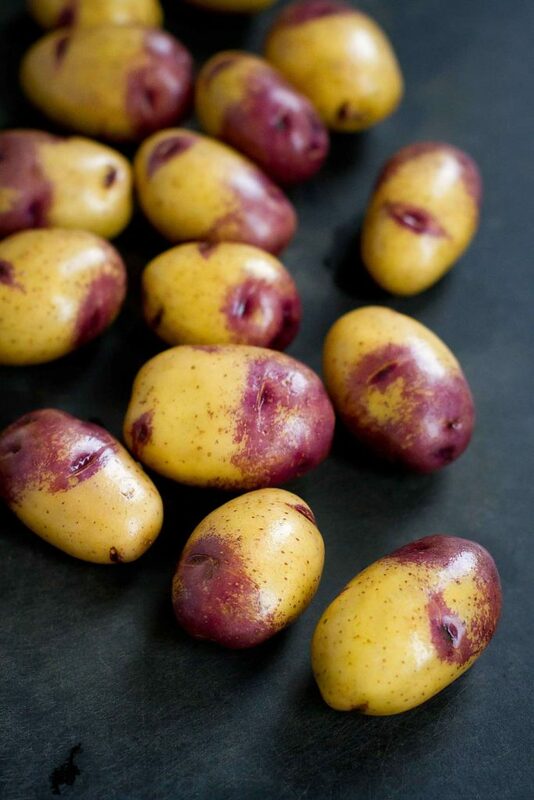 When you’re preparing potatoes with minimal seasoning, be sure to start with potatoes that have good natural flavor. For me, that means cooking with The Little Potato Company Creamer potatoes. Any of their varietals will do, but I’m in love with the colors of their Chilean Splash Creamers. Just look at those purple and cream tones. Gorgeous or what? On top of winning all of the potato beauty pageants and tasting great, these Creamer potatoes offer plenty of nutrients, such as fiber, vitamin C, potassium and iron. All the more reason to include them in your diet year-round. The rest of this roasted potato salad is just as easy to put together. Roast the fennel at the same time as the potatoes. While they’re roasting, whisk together the four-ingredient smoked paprika dressing and sauté the shrimp. 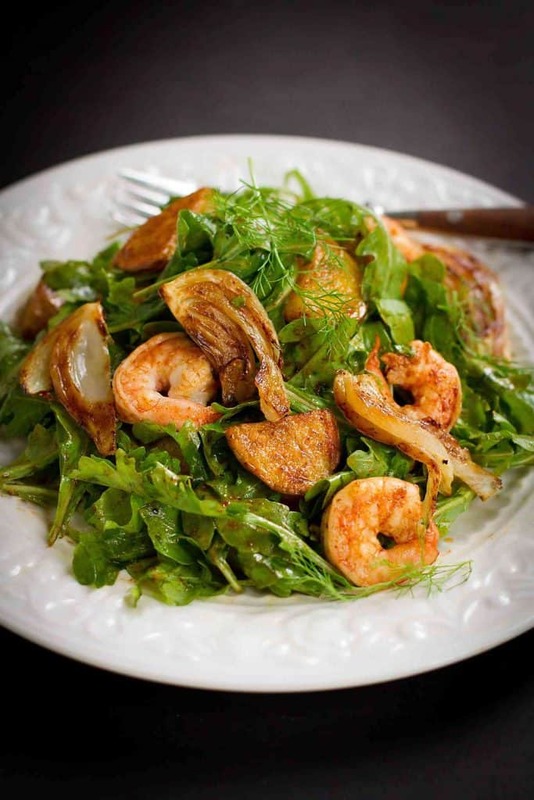 Toss everything together with several handfuls of fresh arugula or any other salad green. Perfect for lunch or a light dinner! Depending on the size of potatoes, cut them either in half or in quarters. For the Chilean Splash Creamers, cut in quarters because they’re larger than other Creamers. Place them on a baking sheet. Toss with 2 teaspoons olive oil, ¼ teaspoon salt and ¼ teaspoon ground pepper. Cut the fennel half through the root, then thinly slice. Place them on a second baking sheet. Gently toss with 2 teaspoons olive oil, ¼ teaspoon salt and ¼ teaspoon ground pepper. Heat a large nonstick skillet over medium-high heat. Toss the shrimp with 1 teaspoons olive oil and ⅛ teaspoons salt, and add to skillet. Cook until just cooked through, about 1 minute per side. Those potatoes are absolutely beautiful, and I love how golden brown you got the potatoes and the fennel. This is my kind of salad! This is such a unique way to enjoy shrimp. I’ve been needing to add some new recipes to my routine! Those spuds are gorgeous! I am going to look for them at my store. This is the perfect meal to introduce (several times) during the busy holiday season. I love how light, and yet flavorful this is! Yum! I could eat this every day of the week! I feel like fennel is one of those under rated vegetables but I love it and it looks so good in this dish! AH! What a brilliant idea! I’ve never had roasted potatoes ON A SALAD before, and I’ve gotta try it this month. What a gorgeous salad and striking combination of ingredients! This is just gorgeous Dara!! Need this salad STAT! This is gorgeous Dara! We love shrimp!! I don’t use fennel nearly enough! This salad looks fabulous! Those have to be the prettiest potatoes I’ve ever seen! 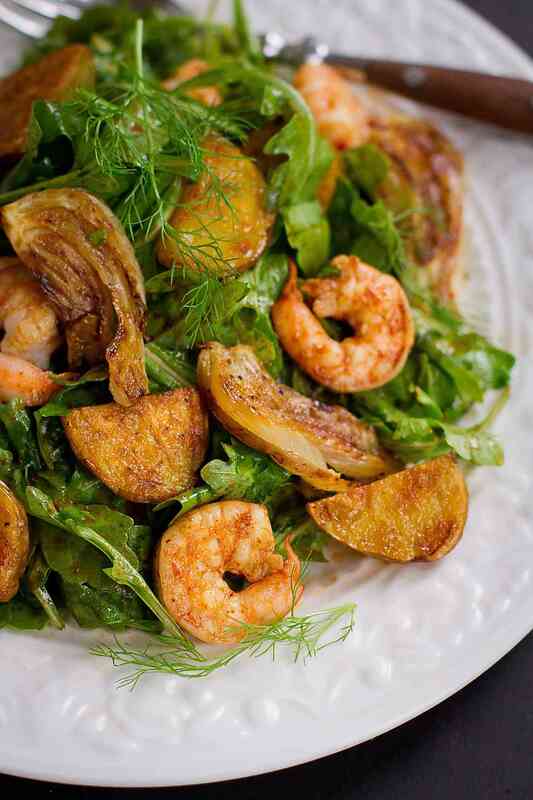 Also LOVE shrimp and fennel together! This salad is just Gorgeous, Dara! It also looks so satisfying and full of flavor! Yum!